Premiere: May 1998, at the Piccolo Spoleto Festival: Deanna McBroom, soprano, and Marc Regnier, guitar. 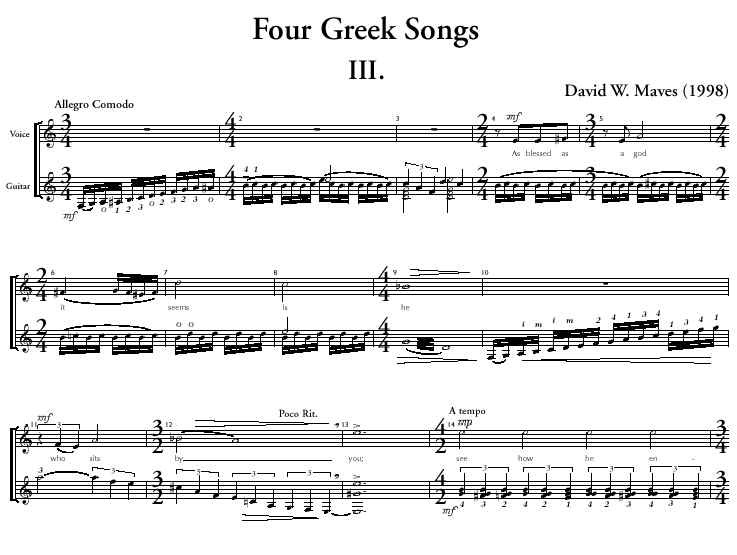 Text by the composer: free translations from fragments in the Ancient Greek by the lyric poet Sappho. 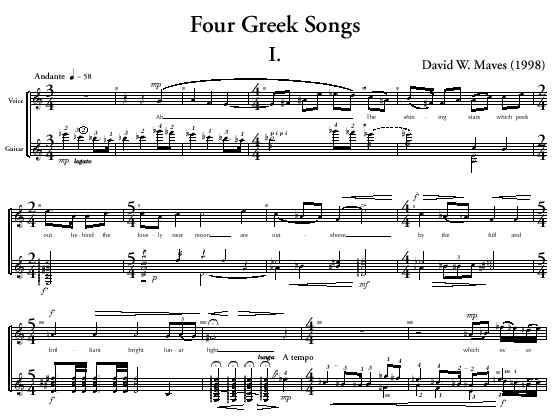 After various visits to Greece, I wanted to make some kind of musical statement about ancient Greece, which I had studied and thought about, a lot, and wherein, I believe, has originated just about every good thought we've ever had about evolving into a decent collective society with a worthwhile "high" art. For texts I have chosen the words of (by most accounts) the greatest lyric poet of all time: Sappho. 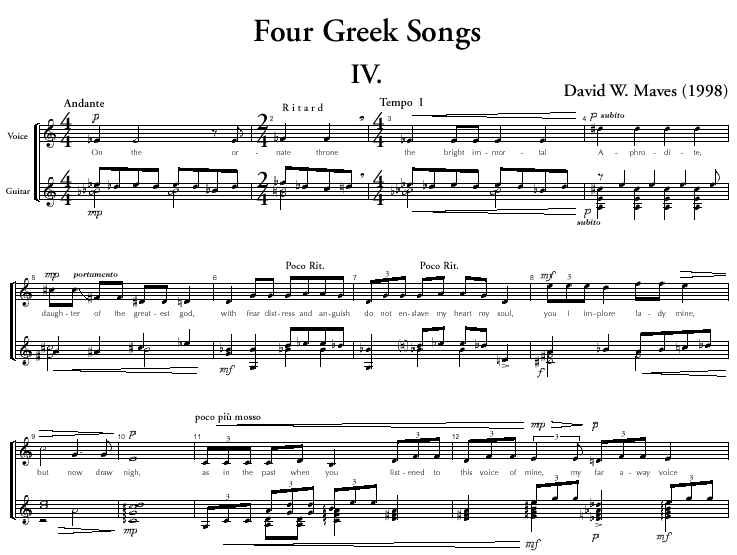 The problem with these "snippets" (we don't really have much of her work) is that, like Ancient Greek Musical fragments, we know almost everything...except how they sounded. Modern attempts to approximate the sounds of Sappho's ancient tests, (in spite of many valiant efforts) ring don't ring true. And translations in to English seem equally stilted. As Ezra Pound once rather testily remarked, upon publication of yet another attempt: "Nobody seems to have mastered the ladies' meter." 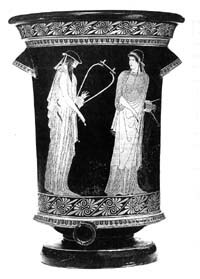 Every pictorial representation of Sappho (mostly on Greek pottery) shows her with her lyre. 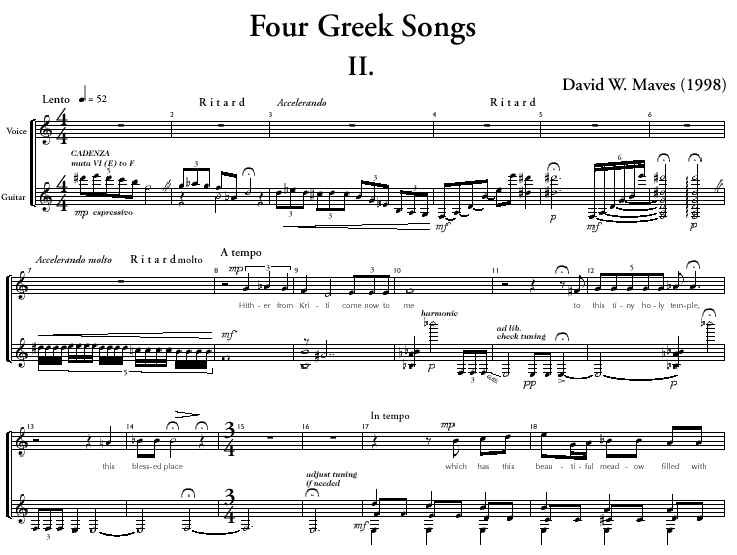 Plainly these texts were meant to be sung not spoken. And no one knows how to do this! What I have attempted is a translation into modern Greek of Sappho's fragments (with enormous amounts of help and encouragement from Ross McGoulus and Professor Wagman. The later translations into English are my own paraphrases. 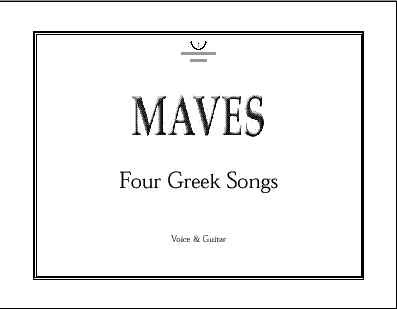 The original version of these songs is for soprano and guitar, which though not a lyre, is at least a somewhat similar instrument. If the version with piano is performed, the piano should sound not like a piano, but like some in between instrument that has an unusual delicate mostly non legato sound. And if a grand piano is used with the lid raised sufficiently, the passages played with a plectrum (so indicated in the score) will help deliver the unusual, ethereal quality that comes effortlessly for a guitarist. These songs are a collaborative effort, and the result of actions and kindnesses by several people. Dr. Frank Morris Chairman of the Classics Department at the College of Charleston, allowing me to tag along with two of his Greek classes in different years, is totally responsible for getting me to Greece both times. Chasing around that incredible country for several weeks, studying archeology and ruins and artifacts, art, drama and philosophy there and on several of the islands in the Agean Sea made the kind of indelible impression upon my psyche that somehow had to be expressed in music. Some time later guitarist Marc Regnier and soprano Deanna McBroom, both of whom are colleagues of mine on the faculty at the College of Charleston approached me to do some songs for them. Deanna and Ross McGoulus, also a singer/teacher and a wonderful musician/person who also is/speaks Greek, spent hours helping me with the translations from Ancient, to Modern Greek, and then to English, and then with the employment (of these wonderful fragments by Sappho) Dr. Robert Wagman, Professor of Classics at the University of Florida at Gainsville with his encyclopedic knowledge of both ancient and modern Greek was by virtue of recent discoveries able to help with insertions and translations of missing snippets in the original text. The short story is that these songs are the result. over all the earth scatters a silent sheen of silveriness. and the aroma of incense sifting, wafting 'round the altars. the sleep of enchantment flows through. what now do you ask more, what is it this time? to your embrace now? What, Sappho, preoccupies you now? she all too soon shall love you." as you now stand by me.